my shiny objects: Holiday Deadline! 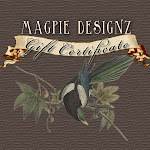 Hurry...go tell your MIL, hubby and sister that Magpie Designz holiday deadline is November 22nd. Sorry husbands, but November 23rd is one day TOO LATE. I wish I could make exceptions. Trust me, I get pathetic stories for a good month after my deadline, begging me to make just that one exception. Production time is 3-4 weeks during this peak holiday season. Please, please plan accordingly. Now I am begging. Also remember that the postal service is busier now too, so packages may take longer to be delivered.